Film Intuition: Review Database: Dr. Seuss’ Horton Hears a Who! “I meant what I said, and I said what I meant. 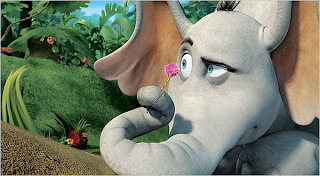 An elephant’s faithful one hundred percent,” so goes the famous quote from Dr. Seuss’ Horton Hatches the Egg that seems to be even more poignant when scripted for actor Jim Carrey as he lends his vocal talents to bring children’s literature’s best loved elephant to life in Dr. Seuss’ Horton Hears a Who! From the same studio who created the family films Ice Age and Robots, Blue Sky Studios of 20th Century Fox, directors Jimmy Hayward and Steve Martino craft not only the best adaptation of Dr. Seuss brought to screen thus far but also the best family film of 2008 as of this review. Note: The book, which was published in 1954 sent some readers and journalists looking at Seuss’ work as a political allegory and in a fascinating sidebar “Who are the Whos?” by Entertainment Weekly’s Adam Markovitz (3/21/08, p42) chronicles three takes on the work, including the two likeliest which saw it as first a look at postwar Japan (which Seuss has admitted) and secondly as yet another 1950’s artistic offering that echoed the political climate of America during the devastating McCarthy hearings.